There are 3 collectable promotion types that come to mind when you say Salada. The plastic baseball coins, the Game Fish cards, and the Historical Picture contest. OK, OK, if you want to be all official about it, here is yet another list. This is what I believe to be a comprehensive list of all of the series and when they were issued. If you have a different feeling, please contact me and we'll square it up. This was a cool contest held back in late 1960, early 1961. Salada put out 10 different tea cards with pictures of well known places in Canada. Similar to an episode of "Mission Impossible", they challenged tea drinkers to identify the names of all 10 landmarks before the contest closed on May 15, 1961. Here is an excerpt of the offer from the back of one of the cards. So who won? How many people got it right? What are the names of the landmarks? I scoured the world wide web and could not find the answers. We may never know who won or how many people got it all right. I did ask you all to try and figure out all 10 places. You did a wonderful job solving the mystery. All of the landmarks have been identified. Thanks to Jacques Vincent for the first contribution to the page and the idea to make it! The Canadian Game Fish series is a great one. The cards are extremely fragile though and getting a nice set can be difficult. By the way, it says Series "A" on the cards. Sadly, no series "B" was ever produced. It was not that long ago that I discovered there was an album to collect them in. I suppose if I had bothered to read the bottom of each card I might have had a clue. If you look at the coin shown here, I think it says that there are 120 to collect. I know they came in different colors and that sport collecting websites tout that there are 221 total but I can't tell you much else. Wayne Scott tells me that there are a lot of variations. He also said that a second rare set was produced with clips so that they could be attached to shirts and ball caps at the games. They were created for use on opening day stadium promotions by the Red Sox, Yankees and Mets. So far there are only 9 different confirmed coins, although there are probably more that have not turned up yet. Price of the 9 known ones are around $ 300.00. 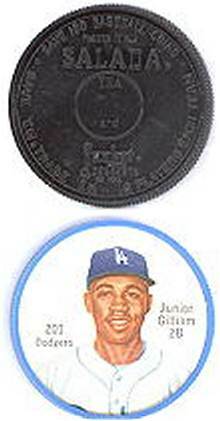 There was also a 1963 Salada set of 63 metal coins called All Star Baseball Coins and featured most of the top players of the day. They certainly remind me of the plastic Jello car and airplane coins, if nothing else. If you know more, let me know and we'll put up more about them. Thanks to Wayne Scott for his update on the coins!